Presentation skills are critical in the business world. Whether you are an MBA student who has to present an idea in front of the class for an academic project, an executive who has to make a presentation to spearhead the strategic meeting, or a business owner who has to pitch his/her business idea to the potential investors and clients, practising and honing your presentation skill is essential. So, what is it that separates a good presentation from the one that fails to make a lasting impact on the audience? What are some of the common mistakes that you can avoid? Here are a few guidelines to follow, the next time you are preparing yourself for a presentation. How many slides should you have in the PowerPoint presentation? How much of text should you put on those slides? How long should the presentation be? 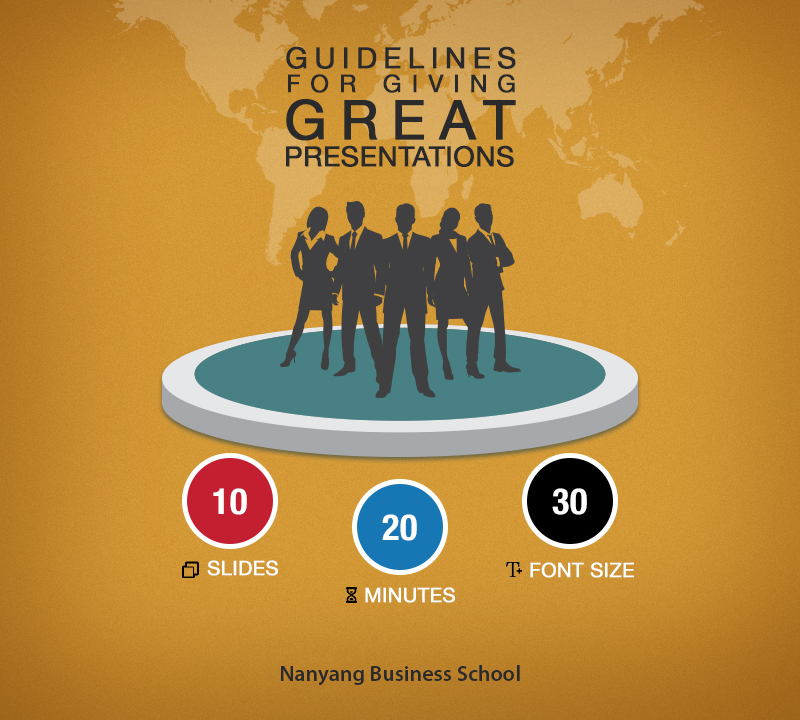 ‘10 Slides’ is the ideal number for a presentation. If you have 20 or 30 slides for instance, it’s time to evaluate the need for the additional slides. Ask yourself – Is it critical to the message I am trying to convey? Can I do without this slide? Can this point be combined with another point that I have already made in one of the previous slides? Having a number constraint on the slides ensures that your audience stays attentive throughout the presentation. 20 minutes is the longest time that you should take to speak and convey the message of your presentation. Even if you are given more than 30 minutes to give the presentation, restrict your speaking to 20 minutes and use the remaining time to invite questions from the audience or engage in open-ended discussion. Presentations are powerful when the audience is actively engaged in them and not just playing the role of a passive listener. You have restricted your presentation to 10 slides, and have ensured that your speaking doesn’t exceed 20 minutes. But, if your slides are stuffed with content, and with a text of size smaller than 20-point, then your audience wouldn’t be able to closely follow the presentation and read the content on the slides. Guy Kawasaki suggests that 30-point font should be the smallest font size that you should use on your slides to maintain their readability. “The reason people use a small font is twofold: first, that they don’t know their material well enough; second, they think that more text is more convincing. Total bozosity. Force yourself to use no font smaller than thirty points. I guarantee it will make your presentations better because it requires you to find the most salient points and to know how to explain them well. If “thirty points,” is too dogmatic, the I offer you an algorithm: find out the age of the oldest person in your audience and divide it by two. That’s your optimal font size,” he adds. Know your audience well to communicate your idea effectively. Their level of understanding of your subject matter is critical while preparing the content of the presentation. Use images to make your presentation more interesting and visually-appealing. Tell stories to grab the attention of the audience, and to establish an emotional connection with them. The content of the presentation is significant, but so is the level of confidence of the presenter. Speak with passion and conviction. After each presentation, make note of the things that went well and the things that did not. Invite feedback from the audience. It’s the only way to learn and improve your presentation skills. Last but not the least, grab every chance that you get to practise your presentation skills. It’s only by doing it more and doing it often that you get better at this skill.